You know those snack foods that are so addicting you can’t just have one or two handful’s? Yes, particularly the sweet and savory snack mix that satisfies both your hunger and your craving for something sweet. 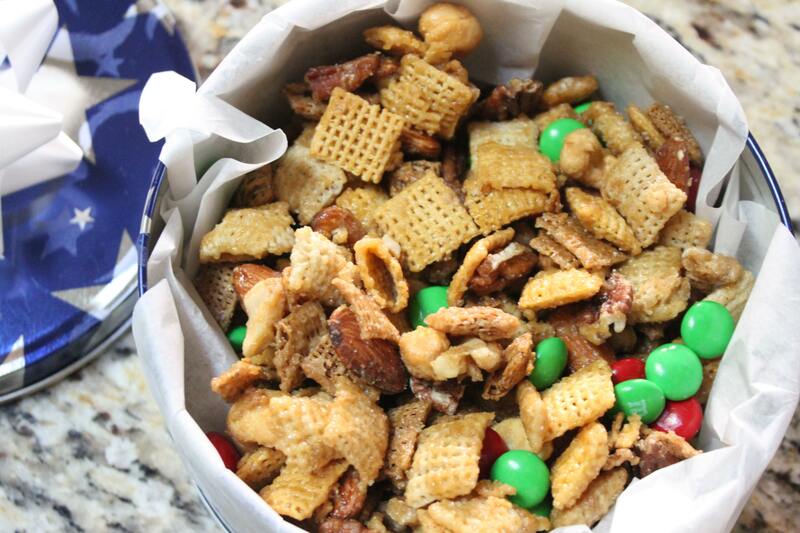 This recipe is one of those addictive snack mixes and thanks to my sweet neighbor Heather, I now have another great recipe to whip up and take to our next holiday party. Heather shares in my love for cooking. She always has great ideas, suggestions and fun little kitchen gadgets, which she kindly lends me. I love having a neighbor that really will lend you a cup of sugar anytime and of course it’s also nice when I’m given fun treats like this one. Thanks Heather, I look forward to many more days of neighboring and cooking together. In a medium size sauce pan melt all of the butter, brown sugar and light corn syrup. Boil for 2 minutes, remove from heat and add cream of tarter and baking soda. Mix thoroughly (mixture will begin to foam up) and immediately pour hot mixture over the dry ingredients. Mix and bake at 350 degrees for 15 minutes, stirring every 5 minutes. Spread onto wax paper, sprinkle lightly with salt and once it cools add one 12oz bag of M&M’s. notes: Nuts can be rather pricey so to save some cash and still have a great party mix you can substitute cheerios and pretzels instead.